Not only are Australia running scared of England but they have also been given the willies by ghostly goings on at their hotel. 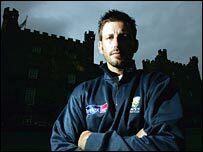 Australia are staying at 700-year-old Lumley Castle in Chester-le-Street close to where they will be playing a day-nighter against England on Thursday. But they have been spooked so much by the legend of a ghost that all-rounder Shane Watson is reported to have slept on Brett Lee's floor! Local legend says the castle is haunted by Lily Lumley, a 14th century lady of the manor, who was apparently thrown down a well in the castle grounds by two priests after she refused the Catholic Church. Australia media officer Belinda Dennett said: "Several of the players were uneasy although a lot of them in the morning said they were fine. "I saw ghosts. I swear I'm telling the truth. "I closed the blind in my room before I went to bed. But when I was woken up at 4am by my phone, the blind was up again. "I looked out of the window and saw a procession of white people walking past. It was amazing, very scary." Australia are not the only team to be spooked by the spectre. In 2000, three members of the West Indies team including captain Jimmy Adams checked out of the same hotel because they were scared.